If you're a nature lover, Heron Island really is a special place. It's a natural coral cay 89kms off the coast of Queensland, so it's not another Great Barrier Reef resort, it's a resort on the Great Barrier Reef. You don’t have to take any special boat trips to experience one of the wonders of the world. The reef, with a myriad of colourful coral and reef fish, is right there, at your fingertips, right off the beach. In the crystal clear aquamarine waters surrounding the island, stunning coral gardens and sea creatures great and small flourish in abundance and colour. 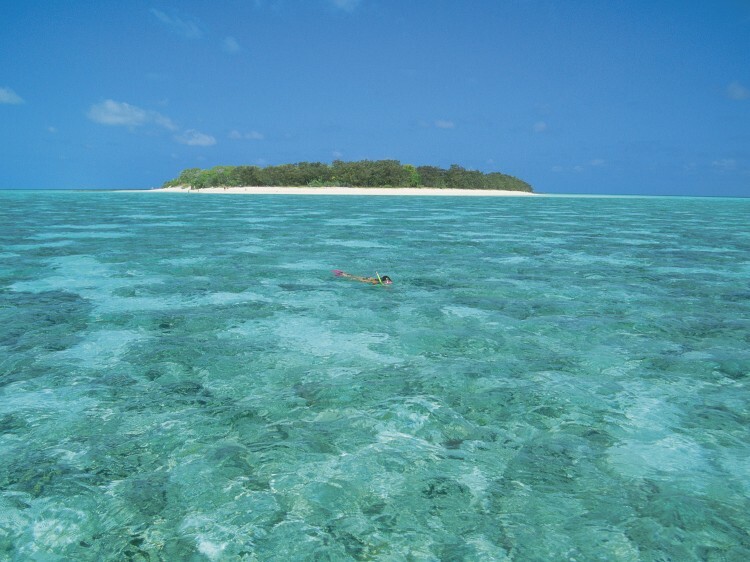 They make Heron Island a natural place for divers, swimmers, and people who love to snorkel. The resort also offers an array of choices for those who like to explore and laze on beaches far from crowds, with no reef “day-trippers” to spoil the peace and quiet. If starting your day with a sunrise and finishing it off with a spectacular sunset is your thing, Heron Island is your island. This is an exclusive island for guests only (no day-trippers here) and, with television-free rooms and no mobile phone reception, it's ideally positioned to take you “back to nature”, as it is a natural coral cay. The nature itself is absolutely spectacular. Scuba divers come back again and again to fully discover the 20 dive sites that are just minutes off the island. The resort caters to both couples and families and has approximately 100 comfortable rooms, all with ceiling fans and either balconies or terraces. Heron Island is small enough to walk around in 20 minutes, yet it has everything you could wish for: a restaurant (Shearwater Restaurant) to satisfy healthy appetites, a deep resort swimming pool backing onto a bar (Baillie's Bar) and an abundance of wildlife that will truly amaze. Turtles return year after year to lay their eggs and guests can gather just outside their rooms (particularly the Beachside Suites) to watch the hatchlings make their way to the water. Come June you may see whales passing by on their annual pilgrimage. Nesting season sees the island's resident human population well outnumbered by birds. The island's “twitchers list” (available from the information centre) lists no fewer than 19 birds; two of which (the Black Noddy and the Wedge-tailed Shearwater) visit annually from October to March to breed. Dive the Great Barrier Reef - with more than 20 dive and snorkelling sites, including the Heron Bommie, one of Jacques Cousteau's favourite dives! Secrets of The Reef Flat Guided Tour - addition to our complimentary walk, where you will journey from the reef flat to the reef crest, rarely explored by most people. Suitable for those with a thirst for knowledge who want to see some rarely seen reef creatures. Enjoy a specially prepared Beach Picnic Hamper at any spot you choose on Heron Island. Enjoy a guided tour of the southern night sky with Stargazing. Binoculars and a telescope are provided. Drawing inspiration from Heron Island's dramatic Great Barrier Reef location, the Aqua Soul Spa is influenced by the rich and diverse beauty of the sea. Aqua Soul Spa has been created to enhance your health and well-being by embracing the powerful healing qualities of the sea and earth. The spa is operating 5 days per week, Wednesday to Sunday. Shearwater Restaurant - offers an enticing evening menu, themed buffet lunches and a vast array of breakfast selections. Those looking at healthy options will be impressed, as will those looking for creative desserts and indulgent flavours. Opening Hours - Breakfast: 7.30am to 9.30am daily. Served buffet style. Lunch: 12.00pm to 4.00pm daily. Served a la carte menu or buffet lunch. Dinner: 6.30pm to 9.00pm daily. Table d'hote menu available 5 nights a week and buffet menu 2 nights a week. Baillies Bar & Pandanus Lounge - relax with a cold drink, catch up with friends or watch or read the latest news. Designed to make the most of panoramic reef views and has an outdoor terrace with a giant chessboard. Inside are two pool tables, a cocktail bar, entertainment lounge and a mezzanine level library area. Sports fans can watch the big games on one of three televisions and Wi-Fi is available for those with their own laptops or smartphones (charges apply). Watching the sunset from the lounges lining the terrace with cocktail or beer in hand is a must-do activity on Heron Island. Light snack options are available throughout the day. Regular flights to Gladstone are available via Brisbane. 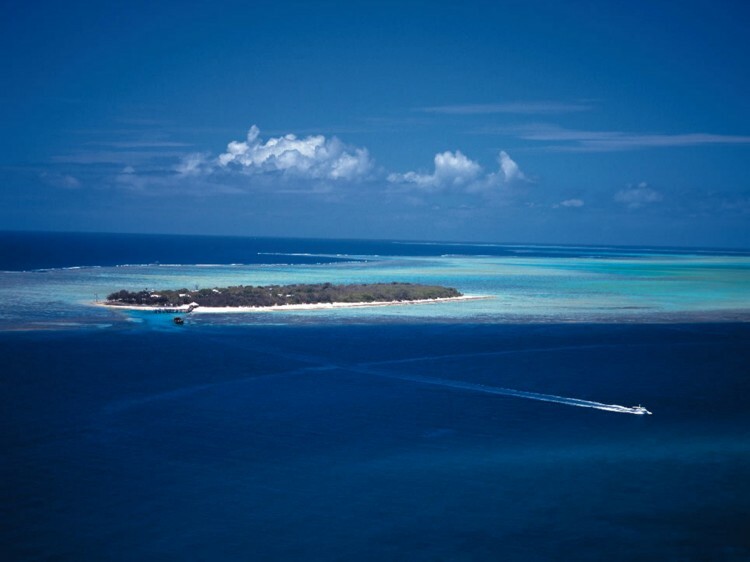 Once at Gladstone, you have a choice of transfer options to get to Heron Island itself. Please note: As of 6 April, 2014 at 3am, Heron Island will revert to EST which is the same time as Gladstone, Queensland. By Boat - Transfer duration: approximately 2 hours. At 34 metres, The Heron Islander is specifically designed to provide a comfortable and spacious transfer from Gladstone Marina to Heron Island. Launched in 2007, she comfortably seats 170 and has a top speed of 30 knots (55kmh). Transfers from Gladstone Airport to Gladstone Marina are included in the Boat Transfer price. By Helicopter - Transfer duration: approximately 30 minutes. HeliReef operate flights between Heron Island and Gladstone with a minimum of 4 guests, subject to availability. Please make your own way to the HeliReef Terminal which is located a short 4 minute drive from the Main Gladstone Terminal. A luggage restriction of 15kg per person applies at all times and we also require each guest's body weight to be advised at time of booking due to strict weight limitations on each flight. For further information regarding helicopter flights, please speak to one of our Reservations Consultants. By Seaplane - Transfer duration: approximately 25 minutes. Australia by Seaplane, operates the scenic transfers daily (excluding Christmas Day) between 7am and 4.30pm from Gladstone; and between 8am and 5.30pm from Heron Island subject to availability and tides times. Arriving into Gladstone, please make your way to the Australia by Seaplane Counter, adjacent to the baggage carousel at Gladstone Airport. Please allow 75 minutes prior to arrival and departure to allow for check-in procedures. Baggage allowance of 15kg per person (including hand luggage) applies. A minimum of 2 passengers per flight are required to operate. Please note: aircraft is boarded via a short step ladder (3 steps) and would not be suitable for anyone with serious mobility issues. In a tropical garden setting close to amenities, ground level and feature a deck and outdoor area. Closer to the beach, with reef and water views through a canopy of trees. Featuring a living area extended outdoors to a balcony or garden. Offering filtered views over Heron Reef and set in prime locations with access to both the beach and reef. Secluded garden setting with a private outdoor terrace and a two-person hammock. Set in a premium grass-front position offering uninterrupted reef views and magical sunsets. Located beachside and set within a grove of trees offering filtered ocean views plus a private boardwalk that provides direct access to the beach. 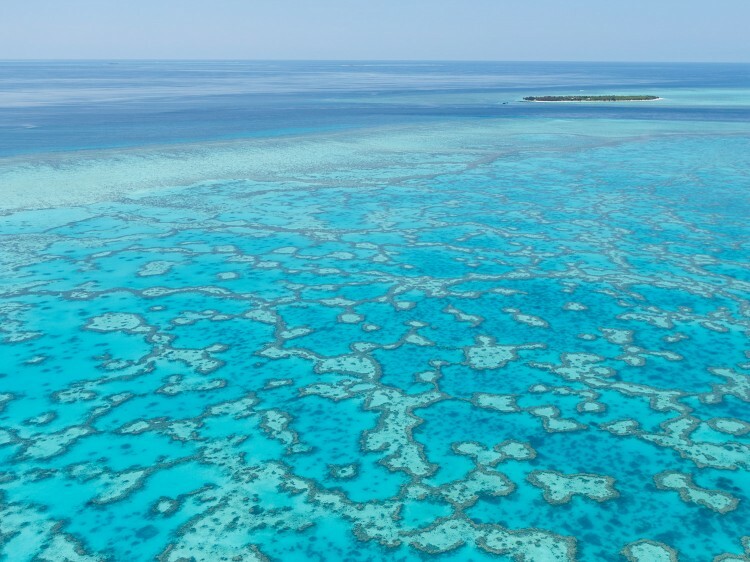 Great Barrier Reef Marine Park Authority has implemented an environmental management charge (EMC). The EMC applies to all visitors to the Great Barrier Reef Marine Park. 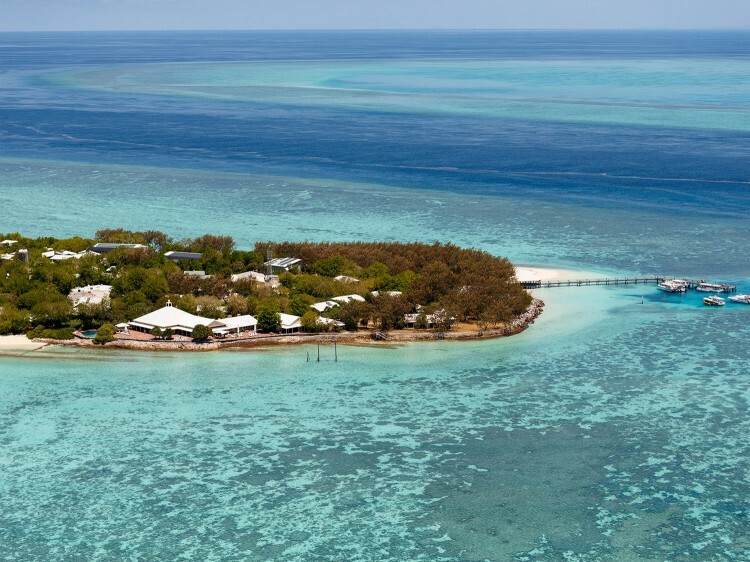 As Heron Island is located within the Great Barrier Reef Marine Park, a fee of $6.50 (excl GST) per person per day (for guests 5 years and older) to a maximum of $19.50 per person per stay will be charged direct to guests upon check-out.